Predictability is among the most damning of descriptions. On the surface the word is fairly innocuous, its definition suggests nothing offensive – “Happening in a way that’s expected” – yet being predictable is never how you want to be described, whether it’s referring to something specific that you’ve done or if it’s applied to you overall as a person. After the startling manner in which we were first introduced to him a few months back almost everything about Joe Swift that followed, from his approach to his career arc, was all too predictable. One of the fun things about doing this whole time machine travelogue through rock history has been having unexpected artists and records make a huge impression. As stated long ago on our About page, for too long rock history has been focused inordinately on only the brightest stars and the biggest hits, dismissing everything else outright. But the definition of history after all is the knowledge acquired by investigation and it’s kind of hard to do that when you’re always regurgitating the same shallow, and often inaccurate, treatises all the time rather than actually investigating something deeper in order to learn more about its evolution. So from that standpoint the majority of rock historians have been extremely negligent in their pursuits. Regardless of the sales they might garner the world doesn’t need another book about The Beatles, another documentary on Bob Dylan, another packaging of Elvis Presley’s music or an umpteenth Rolling Stones concert movie. It’s not that those subjects aren’t interesting, it’s simply that they’ve been done to death and the time wasted on revisiting those well-worn subjects could be better spent analyzing the likes of people like Joe Swift. Ahh, you knew we’d tie this all in somehow and in much less time than the usual nine hundred words it takes us around here. Swift’s personal history is barely known. His historical role is but a tiny footnote in the career of a much more legendary figure, that of Johnny Otis, who was the bandleader behind Swift and who was credited on the label no less, giving Otis his first hit record in some capacity. It was also Otis who was the undisputed STAR of that initial offering, That’s Your Last Boogie, for while Swift sang it and was credited as the song’s writer, the arrangement is where the genius lay and that was all Johnny Otis. It’s unquestionably the best arranged record we’ve come across thus far, complex and ahead of its time, yet perfectly suited for the rock world of 1948 and just as intoxicating on its hundredth spin as its first. In fact that magical arrangement was the one aspect of Swift’s career that was NOT predictable in the least, yet of course it was the one thing he presumably had nothing to do with. Swift’s job in that case was simply not to trip over the microphone cord. All he had to do was remain upright, delivering the lyrics in the appropriate stop-time cadence to emphasize the vibrant music behind it. He did so well enough but with his congested nasal vocal tone and lack of any range or nuance he was undoubtedly the weakest point on his own record, yet was still good enough, and the record itself great enough, to allow it to work. One release later, on Lovin’ Baby Blues, his flaws are more evident, thanks to a weaker song (lyrics and overall theme), as well as a slightly less vibrant arrangement which can’t cover up those weaknesses – or more accurately can’t distract us from those weaknesses as much as the first time around. It still wasn’t bad by any means but Otis and crew recycled a lot of what they’d done so well the first time around, making a few changes which may not have improved upon it but were solid alternatives well-worth hearing all the same, so the basic framework itself hadn’t lost any of its appeal. The record held up in large part because the band itself was what the listener remained most focused on, thereby only letting Swift’s shortcomings cut into that appeal ever so slightly and only if you turned your attention to the specifics of what he was singing. But what that record showed was the start of a pattern of predictability a reliance on it that didn’t bode well for Swift’s future chances. Based on all of the records that came out before September 1948, That’s Your Last Boogie was completely UN-predictable. It was a startling record that leapt off the turntable and even now, seven decades later, it still sounds cutting edge. Lovin’ Baby Blues, by not changing up the approach too much, was all too obvious in its aims, bent on recapturing the success of the original record by using a closely related sound. Listeners have shown over time they’re not as tolerant for this as record execs always feel they will be. Predictability is a decided negative when it comes to eliciting interest of the same audience. All of which leads us to Crazy ‘Bout Your Cookin’ which continues the predictability cycle in… well, I’m sure you’ve guessed it… in predictable fashion. Massed horns heavy on the trumpets kick this off already showing it to be a step or two behind the times in that regard, as these type of horn charts are the last vestiges of the pre-rock mentality. They at least play with genuine zest on the intro but as the song unfolds their continued presence is emphasized far too much and make this sound more than a little dated, enthusiastic or not. By the solo it all falls apart though, no amount of good intentions can compensate for archaic squawking. The piano is providing the primary means of transportation throughout, delivering the main rhythmic thrust with Otis’s drums riding in the sidecar, both of which keeps it headed in the right direction but without any real impetus. On one hand you’re glad they didn’t simply recycle the interlocking drum patterns that had served the previous two efforts so well, for at a certain point you’re only declaring creative bankruptcy if you continue in that same direction, but it’s a pity that they didn’t at least understand the exotic excitement it created was all that was keeping Swift – never the best singer to begin with – from weighing down his own records and set out to at least replace it with something more invigorating. Shorn of anything suitably rambunctious behind him Swift is forced to shoulder the bulk of the load here himself and while he, or his lyrics anyway, are designed to be the drawing card of this endeavor they’re going to have to be really good because nothing else about it is shaping up to be. As you might’ve guessed – and surely hoped – the lyrics waste no time before revealing that the girl’s… umm… “cooking” doesn’t take place in the kitchen. In other words if you’re truly hungry for something other than a tasty dish of female carnal delights then you’ve come to the wrong restaurant. Swift doesn’t really disguise this fact, but he also doesn’t use the choicest ingredients to sell the point either and make it a little more intriguing. While certain euphemisms are fairly straightforward, if not altogether clever – I used to go to Mabel’s cause she could roll her dough/but when it comes to fryin’ she kept her fire down too low – I defy ANY one out there, no matter how dirty your mind may be, to make sense of his exclamations about how the girl in question can “really use her pan and pot”. In fact if you DO know keep it to yourself because I’ll either be totally confused at the suggestions or it’ll be so perverted that I’ll never be able to look at kitchen utensils again without getting sick. So what we’re left with is a painfully nasal singer offering up vaguely lewd but by no means titillating sexual references that wouldn’t be sufficient to even stir the loins of a man locked in a monastery for twenty years without female companionship all while Swift is backed by a sluggish, lurching outdated trumpet-led arrangement. It’s conventionally lackluster, the musical equivalent of a chain restaurant’s menu, and if not for the big names associated with it and the fading memory of Swift’s one moment of true glory this wouldn’t draw so much as a second look. Which brings us back to the inevitably doomed career of Joe Swift. When we first met him on the brilliant That’ Your Last Boogie I expressed some sympathy that he’d never been really given his due, not just for the great record but also for his role in introducing the legendary Johnny Otis to a national audience, as that record was the first with Otis’s name attached to make the Billboard charts, launching a fifty year career in the spotlight. 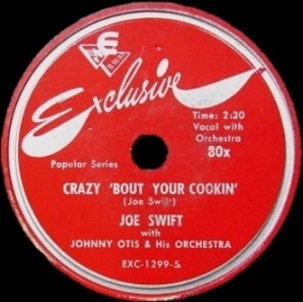 Since then Swift’s given us ample evidence as to why his contributions have been essentially erased from the oft-told Johnny Otis story. The more we hear from him the more obvious it becomes that he was merely in the right place at the right time, hampered by a voice located deep within his nostrils, cursed with insufficient variance as to delivering even well-written songs (his best attribute if the writing credits are accurate) and completely unable to compensate for lesser material with a lightness of vocal touch, and lacking even the sheer exuberance (a la Wynonie Harris) to fall back on when all else fails. It’s become painfully obvious that Swift’s talent ceiling was uniformly low and he’s long since hit it. In keeping with the theme of this essay his rapid decline therefore was entirely predictable. Only when blessed with a startlingly fresh arrangement on his best written song did he fully connect and when any of those other attributes weren’t first rate the holes in his game became too much to overcome. But I still can’t find it in myself to dismiss him entirely and I take no grim pleasure in criticizing his many shortcomings. The fact of the matter is he DID have one great record, which is one more than most artists in rock history, and he hasn’t been given his due for that over time. While everything else he did confirms the reasons behind his enduring lack of acclaim overall, it still can’t completely justify his total obscurity, especially tying in as it does with someone who even today is anything BUT obscure. Joe Swift deserves to be remembered. At a time when rock ‘n’ roll still had no assurances of lasting the dawn of the 1950’s, let alone well into the next century, Swift gave its fans at least one reason to be optimistic that it might carry on. Say what you will about Swift’s limitations but it’s still worth noting that he didn’t wander in to the rock field by accident, didn’t enjoy his brief moment of success and turn his back on it in pursuit of something more high class, he gave it his all each time out and even if you say he failed pretty consistently he kept trying all the same. His fate was tied to rock music from the start and in 1948 when the music was still far from assured of lasting very long that devotion was admirable. In the end it’d be a shame if he were eternally forgotten simply because of how suddenly the genre grew far beyond where it was when he was among its loudest champions. Leave a reply on "Joe Swift: “Crazy ‘Bout Your Cookin”"